Light pollution is dimming the night skies for even some of the most remote telescopes. 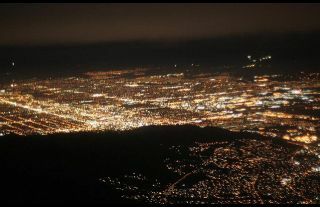 Here, light pollution from Salt Lake City. Back in the 1960s, when I was just starting out in astronomy, I lived in The Bronx, where streetlights significantly limited my view of the stars. But I always looked forward to the times when my family visited my Uncle Ron’s house in Mahopac, N.Y. The night sky in Mahopac — which is 50 miles (80 kilometers) due north of midtown Manhattan — was incredibly dark and starry; even looking south in the direction of New York City, there was very little glow from the big metropolis. Today, it’s a far different story. I now live just to the west of Mahopac, and while I can still see the Milky Way on most clear nights, the nights now are a far cry from what they were a half century ago. Back then, the sky was almost pitch-black. Now, it's closer to a charcoal gray, and when I look south toward New York City, I see a bright, whitish glow reaching nearly halfway up into the sky. In these nearly 50 years, the nights in rural Putnam County, N.Y. have become some six times brighter; the faintest stars that I see now are around fifth magnitude. On the best nights, I can just about make out Eta Ursae Minoris, the dimmest of the four stars that make up the bowl of the Little Dipper. We can thank light pollution for that. Unfortunately, few stargazers these days enjoy unspoiled, pollution-free skies. But for those who do, it is often said that the average naked-eye limit is magnitude 6.5. Over the entire celestial sphere there are 8,479 stars to that magnitude limit. Of course, we couldn’t see them all at once, since half of these available stars are always below the horizon. There is also the factor of atmospheric extinction, which severely reduces the number of stars visible near the horizon, even under ideal skies. Because of all of this, the total number we can see at any given moment is just 2,500 or so. But what about locations severely handicapped by light pollution, such as within the confines of large metropolitan areas? Light pollution is the excessive or misdirected outdoor lighting that is threatening to destroy virtually all casual stargazing. Throughout much of the United States, for instance, millions upon millions of precious watts are wasted because poorly designed streetlamps send a portion of their light into the sky. Over the past two decades, the increase in this ubiquitous, garish lighting has so polluted our nighttime environment that driving on some roadways has become downright dangerous because of excessive glare. The majority of lights on our streets and highways are of the high-pressure sodium vapor variety. They are ugly, overly bright energy wasters. In some of the most extreme cases, drivers even have to lower their sun visors! Let's take the Greater New York area as an example. For those who live in its immediate suburbs, the limiting magnitude, or LM, is probably close to 4.0 (the lower the figure of magnitude, the brighter the star). This corresponds to roughly 250 visible stars, or one-tenth the number that can be perceived under perfectly dark skies. From the outer boroughs of New York City (Brooklyn, Queens, Staten Island and The Bronx), the LM is likely closer to 3.0, suggesting that, at best, only about 50 stars might be seen at any one time. And, from brightly lit midtown Manhattan, the LM is probably near 2.0 — meaning that from the heart of New York City, only 15 stars or so are visible at any one time! But there are solutions to this problem. Light pollution can be controlled and even reduced. As one example, this can be done by investing in more efficient, properly shielded lighting fixtures; determining systematic criteria for how much lighting is needed in a given situation; and perhaps even imposing late-night "curfews" on outdoor advertising signs. Then there’s the International Dark-Sky Association (IDA), founded in 1988, which gathers and disseminates light pollution information and solutions. This organization has played a pivotal role in turning the tide in the light pollution war. The IDA is winning over key sectors of the non-astronomical public — including government groups, sections of the lighting industry, and the electric utilities — with the argument that good lighting for astronomers equals energy savings and more attractive surroundings for everyone else. The IDA's work is funded by nearly 10,000 contributing members. You can do your part, by learning more about light pollution and the IDA and by taking steps to reduce extra nighttime lighting in your own town and backyard. These steps may not only enable you to see the stars better, but could also save you money on electricity and help mitigate the world's energy crises. For more information, visit the IDA website at www.darksky.org. This composite image, which has become a popular poster, shows a global view of Earth at night, compiled from over 400 satellite images. NASA researchers have used these images of nighttime lights to study weather around urban areas. I want to close with a comment made nearly 30 years by the late George Lovi (1939-1993), who for more than two decades penned the "Ramblings" column in Sky & Telescope magazine. In his column from February 1986, Mr. Lovi asked a simple, pointed question: Do we really need the night sky? "Actually," he noted, "we don't. Neither do we need the Grand Canyon, Yosemite and Yellowstone parks, California redwoods, and many other 'useless' natural resources. But in my planetarium talks, when I bring out the starry sky in its natural glory, the audience always 'oohs and aahs' in surprise. I tell them this is the true sky they don’t see, and why it is the next endangered resource, and what can be done. The sky we save will be our own."